With less than 10 months until the launch of Seabourn’s newest ultra-luxury vessel, Seabourn Encore, in December 2016, the award-winning small-ship cruise line is revealing design details of the ship’s beautiful and sophisticated Observation Bar. Located on Deck 11 and surrounded by floor-to-ceiling glass walls, the Observation Bar will be the highest indoor viewing point on the ship – offering stunning 270-degree forward-facing views for guests to enjoy at sea and in port. The centerpiece of the lounge will be a dramatic, semi-circular skylight to cast sunlight and moonlight over the bar area, while comfortable leather lounge chairs and handsome high-backed barstools surround the square bar. The Observation Bar will feature a variety of culinary and beverage services every day from morning until night. In the morning, the Observation Bar will offer the Early Morning Riser continental breakfast, while afternoons will feature the line’s popular daily white glove tea service. As the sun sets and well into the evening, the lounge will transform into a destination for cocktails, canapés, and piano entertainment before and after dinner. Seabourn Encore will expand and build on the line’s award-winning and highly acclaimed Odyssey-class ships, which revolutionized ultra-luxury cruising with enhanced accommodations and innovative amenities when they were introduced between 2009 and 2011. Seabourn Encore will maintain the line’s high ratio of space per guest, enabling highly personalized service. A sister ship, Seabourn Ovation, will join the fleet in 2018. 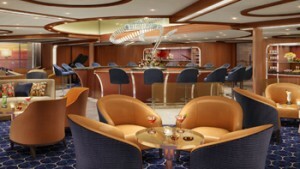 Designed by hospitality design icon Adam D. Tihany, Seabourn Encore will feature modern design elements and innovations consistent with the line’s reputation for understated elegance. The 40,350-GRT ship will be configured with one additional deck and new expanded public areas, and is expected to carry just 600 guests, based on double occupancy. In addition, every suite will feature a private veranda. For more details about the award-winning Seabourn fleet, or to explore the worldwide selection of Seabourn cruising options, contact a professional travel advisor, call Seabourn at 1-800-929-9391 or visitwww.seabourn.com.